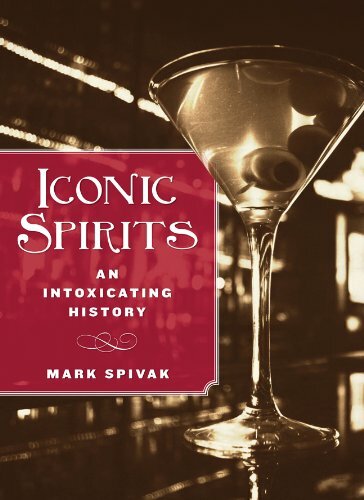 I am pleased to be hosting Mark Spivak as a guest poster today as part of his Iconic Spirits blog tour! Come back tomorrow to read my review! How did a something that tastes like castor oil flavored with tree bark become the sexiest drink on earth? Gaspare Campari invented his famous potion in 1860 by infusing sixty herbs, spices, barks and fruit peels in a mixture of alcohol and distilled water. It became a sensation, and Campari turned into an entrepreneur. There’s only one problem: Campari is bitter, and human beings have taste receptors for bitterness that function as an early warning system, alerting us that we are about to consume something that might be toxic or poisonous. Imagine the dilemma for your brain as you take a sip of cold, refreshing Campari and soda. Part of your mind is saying, “Don’t drink this---it might kill you!” In another sector of your cranium, though, the drink is perceived to be sophisticated and desirable. Given that more than 27 million bottles of Campari are sold each year, the brain has obviously found a way to disregard the potential dangers of bitterness. In researching my book, Iconic spirits: An Intoxicating History, I spoke to scientists doing research on the physiology of taste, and they all had a theory on how this conflict was resolved. More importantly, though, how did Campari come to be regarded as the sexiest drink on earth? The famous 1920 poster by Marcello Dudovich is a good example. Two lovers are locked in an embrace that can only be described as smoldering, balanced precariously on the edge of a sofa and enhanced by a background of soft crimson light. Two glasses, one half-filled with Campari, sit on a nearby table. The woman’s hand rests on the man’s cheek in a classic gesture, pushing him away and embracing him at the same time. In 1998 Campari began working with the celebrated Indian director Tarsem, who created the series of “Red Passion” ads. The campaign was the first in Italy to present female homosexuality in a straightforward yet compelling way; from there it went on to target other social norms. In a 2005 commercial, a man stands at the bar during a reception when he spots a tall, beautiful woman on the other side of the room. They exchange looks. The man obtains a Campari on the rocks from the bartender and follows the woman to a secludedpart of the building. His hand slips as he approaches her, and hesplashes Campari on her dress and cleavage. Slowly and tantalizingly, the woman removes her top and reveals herself to be a man. The man then takes off his shirt to display his bra and the fact that he’s actually a woman. The ad blends mystery and intrigue, explores repressed desires, and blurs the lines of gender identity---all in sixty seconds. So relax and enjoy a cocktail made with Campari, whether it’s a Negroni, Americano, Garibaldi (Campari and orange juice) or a classic Campari and soda---but make sure that someone you care about is there to enjoy it with you. Visit the Iconic Spirits Tour Page to check out the other stops and enter to win a Kindle Fire HD!